For the last 18 months or so, 43″ displays have been the max you can get for a traditional computer monitor on the desktop. Dell was the first, and I ordered their 43″ the day they allowed pre-orders in May 2016; other vendors eventually followed. First, overall, these are 4K screens with pre-HiDPI/Retina resolutions. The 43″s run around 100 pixels per inch, which is about the same as the old 30″ monitors that were 2560×1600. I really like this resolution, but of course it will be great to upgrade to 8K in a few years for the increased sharpness. The Dell 43″: Plenty of inputs. The speakers are OK, but not great. DisplayPort and HDMI only; no USB-C. The buttons are on the front. Color reproduction is adequate for non-color work but definitely not good enough if you’re doing anything serious. The DisplayPort handshake can be iffy with MacOS from time to time (10.13.6 is worse than 10.13.5 was, but 10.13.x has been better than 10.12.x). The main drawback is a dark gray band around the perimeter of the screen. It’s annoying once you notice it; I didn’t notice it til someone else who bought the monitor asked if I had noticed it. (Thanks a lot! :-). The ViewSonic 43″: Like the Dell 43″, it lacks USB-C. The control buttons are on the back and overthought–someone thought you’d like to reach around and get angry to turn on the monitor or use a weird joystick… it’s quite odd. The color is very nice–much better than the Dell, but the screen has a slightly glossy coating, which means reflections can be quite bad on dark backgrounds. 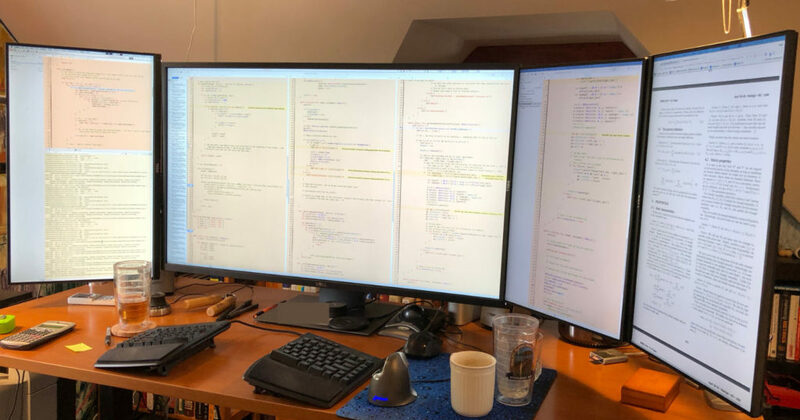 The Dell 38″: One of the downsides with both of the 43″ panels is that they are not curved; I sit about 21″ from the screen in the middle, which means the distance from my eyes to the corners of the screen is about 6″ further away. A curved 43″ would be very nice, and so it turns out the curved 38″ is very nice too. It’s almost as wide, the color is good, and it has USB-C. However… the 1600px height kills it for me. Sure, this is what I had on 30″ displays for years, but once I went to a 2160px tall screen, losing those 500 pixels suddenly matters. 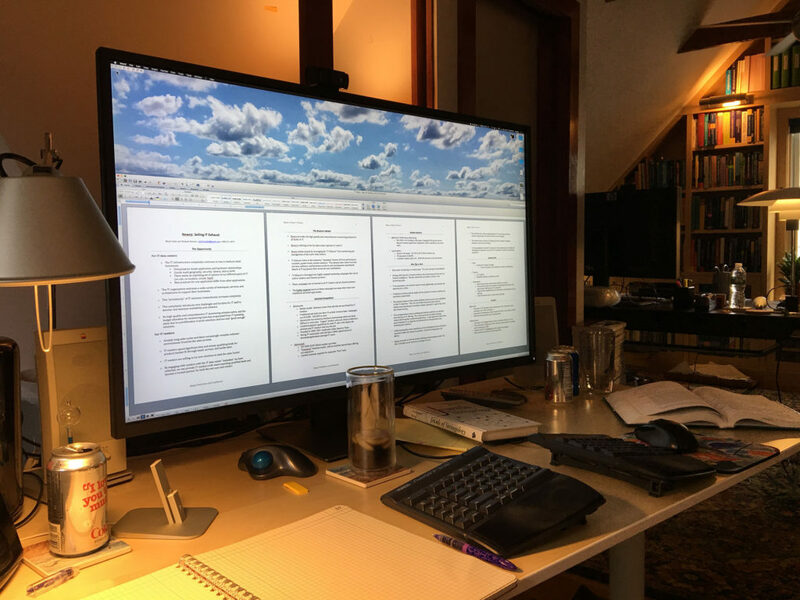 The screen is much shorter in height, as well, which is why I’ve decided to sell my 38″. But if you need USB-C, this is a great buy. One thing to keep in mind with these bigger monitors: If you want to use a monitor arm, the 43″s are big, heavy and may need a 200×200 plate–the bigger arms can cost quite a bit more. I used the 38″ on a modern Ergotron LX arm and it was fine. Ergotron makes a HX series, but I haven’t tried that arm yet. It’s hard to say. The 38″ costs more, but is probably the best overall screen. If you can deal with the gloss, I’d say the Viewsonic 43″ comes in slightly ahead of the Dell 43″, and is probably the best value for the buck. I was sitting on a plane on May 20th waiting to take off back home to Boston when I read about Dell’s release of the P4317Q, a 43″ 3840×2160 monster. I managed to order it before we got in the air. 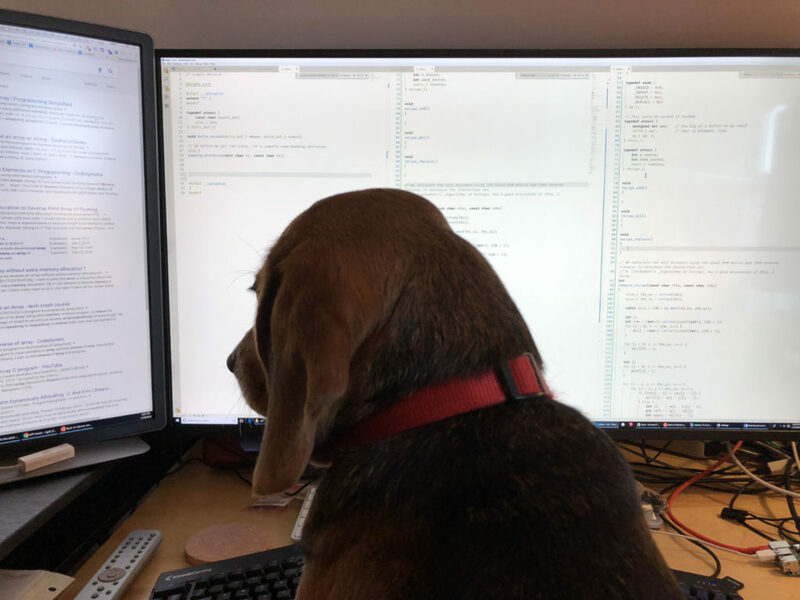 I had been running the Dell 34″ curved monitor with a 27″ in portrait. The wideness of the 34″ was fantastic–it’s easy to see 3 pages of text side by side by side. 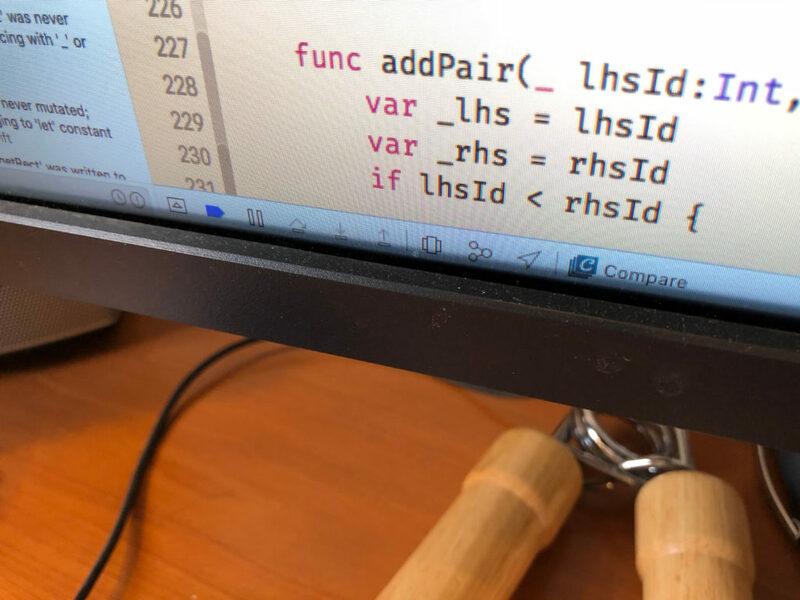 However, the 34″ was frustrating for Xcode work–the 1440 height isn’t ideal for most of my work vs the standard 1600 pixel height of 30″ displays. Although I’ve sold off my original 3×30 Apple displays, I still have and use 3 HP 30″ displays, 2 in one office and 1 in another office. But mostly I just want the biggest workspace possible, and Dell has finally delivered a big workspace. The 43″ runs about 104 pixels per inch, which is comparable to the 30″ 2560×1600 of roughly 100 pixels per inch. This means there’s not a “Retina”-style HiDPI tightness to text, but instead a larger viewing area. Initially I got extremely motion sick from the monitor–It turned out my Gunnar computer glasses were making me sick with this large display. The motion sickness happened within 5 minutes. Since taking them off and spending about 20 hours with the monitor, I’ve found it’s almost exactly what you’d expect–a beautiful, expansive, stunning display with one major caveat: It’s not curved, which means the corners of the screen are about 7″ further away from my eyes than the middle of the screen. Hopefully a curved version is coming. 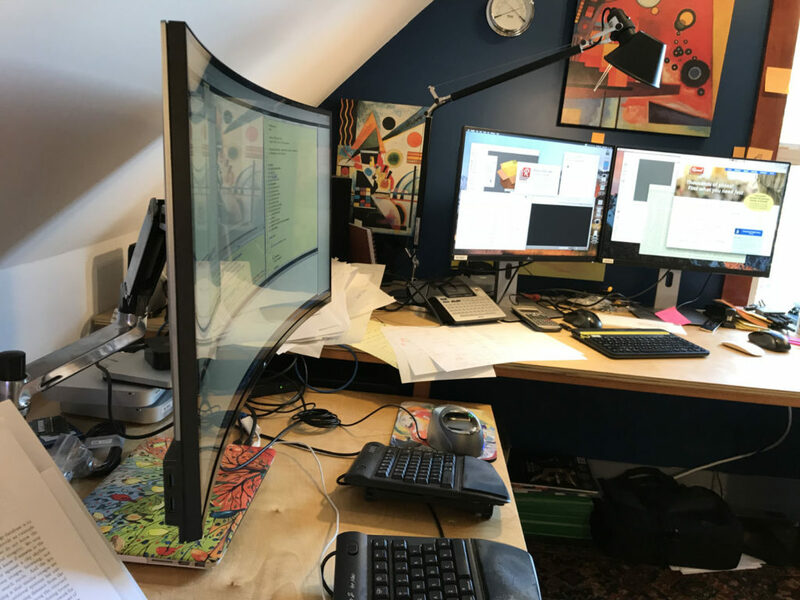 A smaller challenge is that the top of the screen is “too high” if I slouch in my chair–I think the monitor actually works better when my standing desk is elevated, but this is relatively minor. I tried to take some pictures to capture how big this screen is, but nothing really pulls it off. Below is a picture showing a 4 page Word doc at 150% Zoom–the pages are slightly larger on the screen than printed. Without tool bars, it’s quite possible to squeeze in almost 8 pages on the screen in a 4×2 grid without much reduction in size. If you have room for it, are tired of bezels breaking up the view, this could be a good way to go. I’ll definitely upgrade when someone comes out with a curved version or something even wider–I’d love to have a 50″ curved display, perhaps on the order of 5440×2160. In 2001, Lexmark offered a PostScript USB printer for $399. No networking, but laser! For under $400! I bought it. The printer couldn’t print straight (the paper tray was poorly designed), but it was laser! For under $400! On my desk! And it worked with lpd, which meant all of my computers could print (but not parallel to the edges of the page). Data Domain, in 2002 and 2003, actually had two of these same Lexmarks, slightly newer with some tweaks that seemed to fix the paper tray issue. By about 2004 or 2005, Lexmark had a new personal laser printer, which I picked up for about $280. It could print straight and it was fast. Great printer. In 2009, I was preparing for and stressing over a set of presentations with millions of dollars on the line. I was worried about printing slides and bought a color Lexmark laser printer, I think for about $500. I printed my slides (50 pages or so) and didn’t use the printer for about 13 months. When I went to use it again, it had some internal error that apparently meant the printer was now a large boat anchor. I had kept the Canon and just kept using it. In 2012, I had a job interview. I took my résumé printed on that Canon printer with me. I was so embarrassed at the text quality, I didn’t hand it to the interviewer. On my way home, I bought a beefy Brother color laser printer and eventually added the second paper tray and upgraded the RAM to 384 MB. The print quality for graphics was good (not great), and for text it was awesome. The Brother system cost me about $650. The only issue with the Brother was that it often could take 2-5 minutes to warm up before printing. So if I was on the phone and wanted to print something and write down notes, the call could be well on its way by the time I got my document out of the printer. The other issue was that the Brother was a printer only and the Canon was getting long in the tooth–5 years of poor quality copies, no support for TLS-protected emails made it difficult to use for scanning–it was time to upgrade. So I bought a monster HP color laser all-in-one with the huge extra paper tray and rolling stand. It cost about $1500 all told. When I printed a color document and compared it to the Brother, I was blown away–the HP graphics are just awesome. It can print 30 pages before the Brother wakes up to start printing 1. (No kidding!) It works with the Mac Image Capture app for both the flatbed scanner and the document feeder. But… the HP doesn’t reliably wake from sleep over the LAN. It has issues with Chome and PDFs from time to time. The paper tray design is the opposite of what I want–it can hold 250 8.5×11 sheets and 500 8.5×14. I want 250 8.5×14 and 500 8.5×11. Seriously HP, get it together. Its 256 MB of RAM isn’t upgradeable (unreal, I couldn’t believe that). I’ve ended up stringing a USB cable across the office temporarily, since the networking doesn’t work (essentially). During this time, due to the cost of the HP color toner, I bought a $150 Brother laser for my family to use. It’s black and white, takes up minimal space, it’s fast as heck, uses little electricity, and the text quality is better than the Canon–it’s a great little printer! I kind of want one for my office! But of course, no color, copier, or alternative paper trays. Is this so hard? I’ve bought 7 laser printers in the last 15 years and only 2 of them seemed to be good…and they were at the bottom of the market. It makes no sense and it’s frustrating. Today, Storage Newsletter‘s headline quotes an IDC report that personal and low-end storage sales (less than 12 bays) have declined 6.4% y/y. Some dimensions of the business sank 20% y/y. What happened in the last year? Do people create less data than they did a year ago? Isn’t data storage growing tremendously? What is changing is where people create and keep their data. As applications move to the cloud, the data goes with it. From Salesforce to consumer photos, from corporate email to songs, all of this stuff is in someone else’s data center. I have about 100 TB of disks in my house across six fast hardware RAIDs, but all of my critical working set lives in the cloud. The cloud pricing for large amounts of data (e.g., 1 TB) is so cheap that it’s free or bundled (Office 365, Flickr). Dropbox stands alone as an outlier to a priced service and it’s not that expensive–certainly I cannot buy a 1 TB drive and operate it for 1 year at the price point that Dropbox offers. Generally, IT vendors fail to deliver on simplicity; it’s not in their vocabulary. I’ve been in those meetings–hundreds of them, actually–where engineers want to offer every option for the customer and for some reason (lack of vision?) the product manager lets it happen. The problem with these meetings is that everyone in them usually forgets that while the product is the most important thing in the lives of the folks creating the products, the customers have other things on their minds. So we end up with these overly complex IT products that are impossible to use. Quick, how do you set up Postgres database backups with Tivoli? I have no idea but I know it will take a few hours to figure it out (if I am lucky). The brilliance of Amazon’s cloud user interface is that (1) the details are hidden and (2) the user is presented with just the critical options. Do you want to back up this database? Sure! Great, when? Hey, you know, I don’t really care. Just keep the backups for 30 days. One of the most powerful things about AWS is that significant infrastructure is under a single pane of glass. This has been the Holy Grail of IT but never realized. OpenView, System Center, vCenter, TSM–everyone wants to do it, but few organizations pull it off, likely due to a mix of political, technical, and economical reasons. The best part of Gmail going down is that it’s not my problem to bring it back online. Remember when you worked at a place that ran Exchange and the guy in charge of Exchange was always on edge? The only reason that guy is on edge now is that he is waiting for a call to see if he got the job at a place that has switched to Gmail. The data center of the future for most mid-market companies is a single rack consisting of network connectivity, security devices, and WAN acceleration devices. No servers or standalone storage–with applications in the cloud, the only thing needed locally is data caching to augment the WAN overhead and maybe provide short-circuit data movement among local peers. This single rack will fit into a closet. IT will still exist; these cloud applications will still need support, maintenance, and integration–and the network issues will be as challenging as ever. But anyone who is building IT products for on-site installation is facing a significant headwind if you’re not enabling the cloud. I ordered my 2013 Mac Pro the day they went up for sale, even though I had an early morning flight that day. To recap, I bought a 6 core with D500, 1 TB SSD, and upgraded to 64 GB of OWC RAM. I upgraded my old 8 TB Areca RAID to 24 TB, bought an OWC Thunderbolt PCI chassis, and moved over my (old) Areca 1680x card. The OWC chassis is loud, so I also bought the 10 meter Thunderbolt cable and put the adapter box and disks in my office closet. I had been running 3×30″ Apple displays with the cable mess that comes with the DisplayPort->DVI adapters, but recently switched out the Apple displays for my HP ZR30ws. Frankly, the HPs have a better picture, likely just due to crisper, more even lighting as a result of being 6 months old instead of 6 yrs old, but best of all, they require no adapters. I sold my 2012 12-core Mac on Craigslist. The highlights of the new Mac Pro are the lowered energy usage, the reclaimed physical space, and the huge reduction of cable mess. It’s disappointing going to 128 GB of RAM comes at a huge memory speed hit in the new box, but I can live with it (hoping that something better will be available by the time I need more than 64 GB). The new Mac has only been off for about 2 days since I bought it, due to construction in my office. It’s been solid. I’m happy with the upgrade. The only downside that has bitten me is that there’s no locking mechanism for Thunderbolt cables–so if one falls out, and your home directory is on that Thunderbolt device (mine is), it’s very unfortunate. I’ve “solved” this with zip ties for now. A significant number of folks have asked about my thoughts on the new Mac Pro… so here we go. I promise not to tell you the same nonsense you have already read everywhere else (lighted ports, etc.). Some background: I bought an 8-core 2008 Mac Pro on the day they were available for pre-order. It was my main workstation for years, until September 2012, when the speed and RAM ceiling became painful enough to upgrade to the “2012” Mac Pro, a 12 core 2.4 GHz machine. Clock for clock, that upgrade yielded compute performance roughly double the 2008 Mac Pro. I wasn’t sure what to expect with that upgrade, nor was I sure what to expect with the new 2013 Mac Pro. Because of price, I elected to try a 6-core machine with the D500 video, 1 TB flash, and 64 GB of OWC RAM. I recently ran some performance tests to see how things are going with the types of computing I do. One test is a unit test of some code I am writing. The code talks to several VMs on a third Dell VMware ESXi box and spends most of its time in select() loops. There was almost no performance difference between the old and new Macs–about 3%, which isn’t surprising. However, I have some code that runs on local disk and does heavier CPU work. One of the pieces of code shoves a lot of data through a commercial database package inside of a VM. The VM is configured with 8 cores and 16 GB of RAM on both machines. We’ll call this Test A. Another test does extensive CPU calculations on a multi-gigabyte dataset. The dataset is read once, computations are done and correlated. This runs on native hardware and not inside of a VM. We’ll call this Test B. As you can see, the new Mac does the same work in about 40% less time. The CPU work here is in the range of 1-3 cores; it doesn’t scale up to use all the available cores. To keep the tests as fair as possible, the old Mac Pro is booting from a 4-SSD RAID 0+1 and the test data lived on a OWC PCIe flash card. None of these utilize the GPUs of the old or new Macs in any fashion, nor is the code particularly optimized one way or the other. I ran the tests 3 times per machine and flushed the buffer caches before each run. The cable mess behind the new Mac is the same as the old Mac. In fact, it’s really Apple’s active DVI adapters for my old Apple monitors that contribute to most of the cable mess. Once the Apple monitors start to die, that mess will go away, but until then I see little reason to upgrade. The physical space of the new Mac pro is a significant advantage. The old Pro uses 4 sq ft of floor space w/ its external disk array. The new Pro by itself actually consumes a footprint smaller than a Mac Mini (see photo at end of this post)! The fan is quiet, even under heavy CPU load. The top surface seems to range from 110 F — 130 F; the old Mac has a surface exhaust range from 95 — 99 F at the time I measured it. So it’s hotter to the touch, and indeed the sides of the chassis range from 91 F at the very bottom to about 96 F on average. For reference, the top of my closed Retina MacBook at the time I’m writing this is about 90 F and the metal surface of the 30″ Cinema display runs around 88 F to 90 F in my measurements (all measured with an IR non-contact thermometer ). 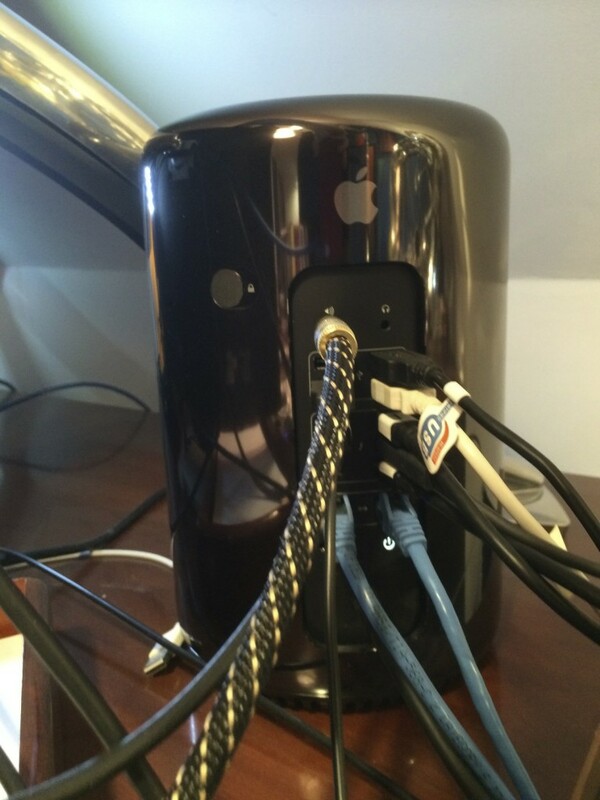 Because there is no “front” of the new Mac Pro, you can turn it at any angle that reduces cable mess without feeling like you’ve got it out of alignment with, say, the edge of a desk. This turns out to be useful if you’re a bit particular about such things. On storage expansion, there’s been a lot of concern about the lack of putting drives into the new Pro. Frankly, I ran my 2008 machine without any internal disks for years, instead using an Areca 1680x SAS RAID. I’m glad to see this change. There’s lots of consumer-level RAIDs out there under $1000, but I’ve given up on using them–performance is poor and integrity is often questionable. I am backing up to a pair of 18 TB Thunderbolt Pegasus systems connected to a Mini in my basement, and bought an Areca ARC-8050 Thunderbolt RAID 8-Bay enclosure and put in 24 TB of disks for the new Pro. Sadly, while it’s fine in a closet or basement, it turns out to be too loud to sit on a desk, so I bit the bullet and ordered a 10 meter Thunderbolt cable. I haven’t received the cable yet, so I haven’t moved my data off my Areca SAS RAID in my old Pro yet. But once that is done, I expect to stop using the old 8 TB SAS RAID and just use the new RAID. These are expensive storage options, but the cheap stuff is even more expensive when it fails. So, should you buy the new Mac Pro? For me, buying this Pro was never about upgrading from my old Pro, but rather upgrading my second workstation–a maxed out 2012 Mac Mini that struggled to drive 30″ displays and crashed regularly while doing so (it’s stable with smaller displays, but in the sample size of four or five Minis I’ve had over the years, none of them could reliably drive a 30″–Apple should really not pretend that they can). In the tests above, I’ve ignored the 900 MHz clock difference, but clearly that contributes to the performance for these kinds of tests. What about price? This new Mac Pro ran me about $6100 with tax, shipping, and the OWC RAM upgrade. The old Mac Pro cost about $6300 for the system, PCIe flash, SSDs, brackets, video card upgrade, and OWC RAM upgrade. (The disk systems are essential to either Mac as a main workstation, but also about the same price as each other.) I don’t view the new Mac Pro as materially different in price. Pretty much every main workstation I’ve had in the last 12 yrs has run into the low five-figures. In the grand scheme of things, it’s still cheaper than, say, premium kitchen appliances, though perhaps it doesn’t last as long! On the other hand, I’m not good enough at cooking that my kitchen appliances are tools that enable income. If I wasn’t using my Macs to make money, I doubt I’d be buying such costly machines. While I am not a video editor, and just do some 3d modeling for fun as part of furniture design or remodeling projects, I feel this machine is warranted for my use in heavy CPU work and/or a desire for a lot of monitors. I’m not in the target GPU-compute market (yet? ), but I do want a big workspace. There’s no other Mac that offers this (I get headaches from the glossy displays Apple offers, though the smaller laptops screens are ok). 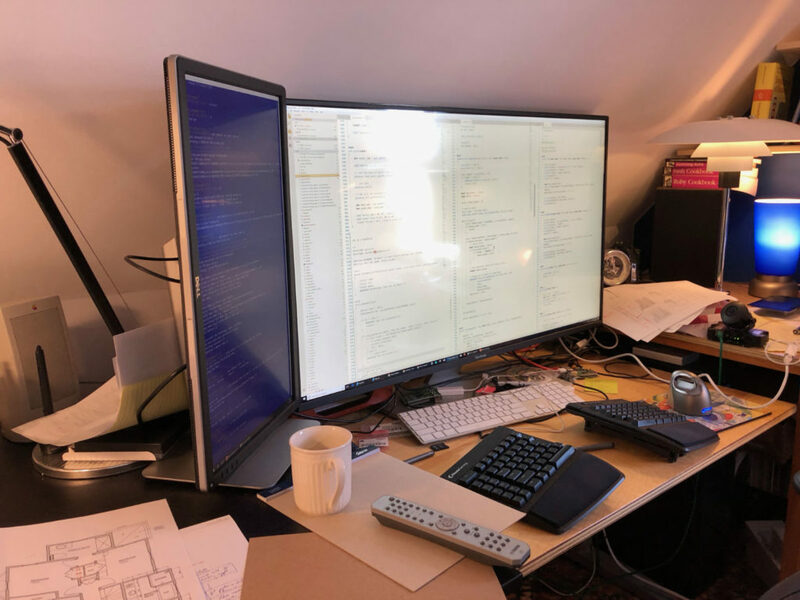 So now on my desk, I have a pair of Pros, each driving a set 3×30″ displays, which matches the work I am doing right now. I haven’t had a video lock up for 12 days and counting, which has proven a huge time saver and frustration reducer, so I’m happy that I jumped on this earlier than later. There are lots of examples of how to use the Ethernet Wiznet chips with Arduino, whether as Ethernet shields or as Ethernet Arduinos on a single board. Unfortunately, most of these examples hard-code the hardware (MAC) address, which can make things painful if you’re building more than one device and running them on the same network. The code snippet below is a more convenient approach. You can setup a prefix (DEADBEEF in the example below) for the hardware address and the last two bytes are set randomly on first boot. The hardware address is stored in EEPROM (7 bytes are needed, 1 for a flag indicating that the next 6 bytes are properly populated). Some serious caveats: There’s only two bytes of randomness here. You might want more. Ideally you would have a manufacturing process, but if you’re just building six devices, who cares? Clearly you would never use this approach in a production environment, but it’s easier than changing the firmware for every device in a hobby environment. You could also use a separate program to write the EEPROM hardware address and keep this “manufacturing junk” out of your main firmware. These issues aside, my main requirement is convenience: I want to be able to burn a single image onto a new board and be up and running immediately without having to remember other steps. Convenience influences repeatability. // bytes are pulled from EEPROM. // network address somewhere that doesn't collide with existing use. The 2012 iPad is not noticeably thicker than the iPad 2 and is still thinner than the original iPad. The 2012 iPad feels heavier. It’s not technically significantly heavier, but that weight in your hand for an extended period feels heavier. It also feels like the weight is distributed differently, though I am not sure that this is true. iPad 2, iPad (2012), iPad 1. All screens on 50% brightness.